Being a swimmer comes with certain pains. One of them is staring at your reflection in the mirror and wondering what happened to your hair color. Another is constantly massaging your own sore shoulders in the middle of meetings or classes. One of the most universal, however, might just be getting water in your ears. Let’s face it; after your workouts most days, it’s just like Venice in there. From the immediate little struggle of fiddling with your ears to drain the water hiding inside, to the long-term struggles of swimmer’s ear or ruptured eardrums, water can be a definite burden to the ear canals. Rest assured; there are ways of stifling the flow. Waterproof headphones, such as our own Swimbuds Sport (wink wink), offer swimmers benefits ranging from a watertight seal to maximum noise isolation, while also allowing them to listen to music, podcasts, and audiobooks on a waterproof music player. The Swimbuds Sport were also designed for flip turns, and they include a selection of tips in a variety of sizes to help you find that perfect watertight fit to keep you swimming hassle-free for hours and hours. Notably, though, even these various tips for waterproof headphones have a specific parentage to thank for their design, and those parents are earplugs. Simple earplugs. The little losable things. These earplugs have one purpose in their existence – to fill your ear, and keep water out. There are three different types of swimming earplugs available in the market: custom molded earplugs; moldable silicone or wax earplugs; and reusable pre-molded silicone or rubber earplugs. With so many brands out there, which ones are actually worth your time and money? 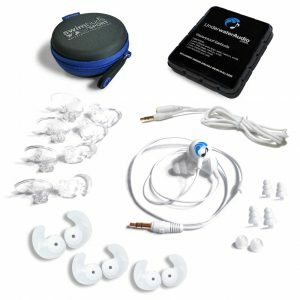 Underwater Audio brings you the top five swimming earplugs on the market today, based on extensive research and reviews.